I remember that 1718 season very well. We do have an opening in 2022. Maybe Merrimack? Dartmouth goes both ends of the spectrum which is fine, as long as a challenging opponent is played at least once a year. Sometimes, even the opponents that seem to be cupcakes when scheduled turn out to be tough opponents by the time the game is played. Rhode Island, Butler and CCSU are examples of that this season. The opposite is true of Cal Poly, which is now a cupcake but was very strong five years ago. Merrimack could be the best team in the NEC five years from now. Last edited by Son of Eli; September 13th, 2018 at 07:29 AM. I know CCSU is willing to travel South on I-91 to the Bowl literally anytime they get an invite. Out of curiosity, would CCSU travel well for such a game? What do your think the attendance would be? Would such a game draw better than say, Sacred Heart? i really want Yale to schedule teams that can boost attendance. The Bowl looks very empty with 7,000 fans. Not many options out there that can draw 15,000. Maybe James Madison and Delaware. Last edited by Son of Eli; September 12th, 2018 at 11:27 PM. i really want Yale to schedule teams that can boost attendance. The Bowl looks every empty with 7,000 fans. Not many options out there that can draw 15,000. Maybe James Madison and Delaware. I think we'd absolutely travel a lot better than most FCS teams could. CCSU has about 65,000 alumni and approx. 85% are in Connecticut, so we certainly are one of the best positioned FCS teams in the area. I'd have to think we'd bring as many and likely more fans than Maine or Mercer will this season. If properly promoted by CCSU and the local media (which it will be), I would expect a very good turnout by students, family, and alumni. I don't think we could match the attendance of UConn in the 1980-90s, but I think we would draw a very good crowd and the vibe would be somewhat similar State U. vs. Ivy. We just got over 5k for our home opener against an unknown D-II last week, so I'd imagine we'd get about the same number to for a 30 mile drive for a game in the historic Yale Bowl. Ok. You sold me. If we can’t play UConn anymore I guess it’s the next best thing. I miss those days. Yes, they were good times. Outside of Whaler games and the GHO, that was one of the great sporting event for the State. Even as a CCSU student, I would head to those games with friends from and Southern and UConn. It was all all-day party in New Haven. Central will never have that kind of draw (and I imagine the tailgating has become a lot tamer since those days), but I bet there is a little nostalgia for that type of event. IMO - it would certainly draw better if UConn is on the road that week. Butler may truly bite the Tigers on the backside. Very apropos comment, considering the origin of Butler's Bulldog nickname. 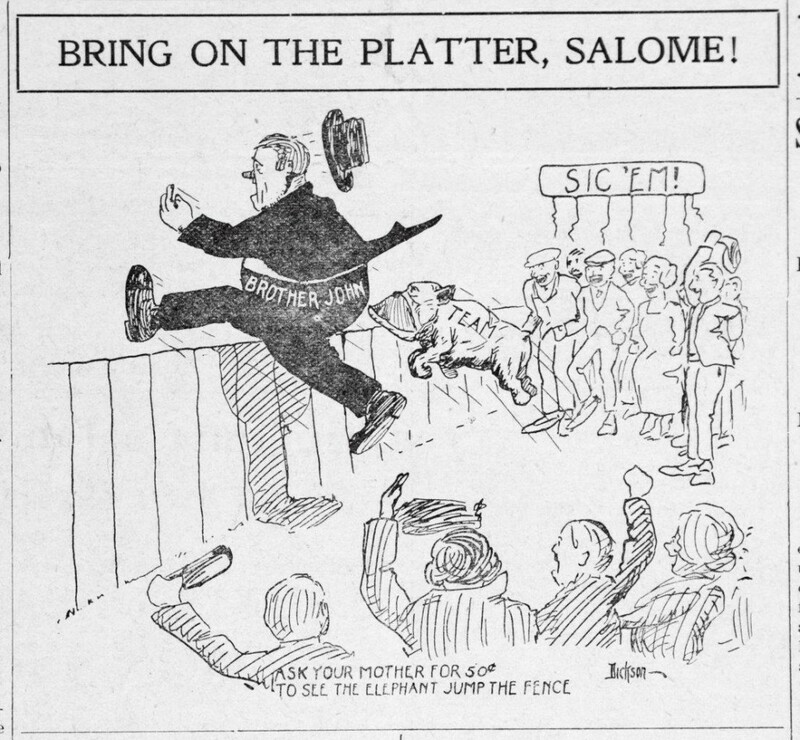 Here is the 1919 cartoon that started it. Offshore sports book has Princeton favored by 10 1\2.